Marie and Johann Krige of Kanonkop. Marie Krige, wife of Johan Krige who’s joint owner of Kanonkop Estate, has been up at six a few mornings this week, preparing sweet-potatoes, salads and snoek in her kitchen, doing the flowers and suchlike in the public rooms, and other things that vitally help the Stellenbosch launch of Kanonkop’s Black Label Pinotage to be the happy experience it invariably is (over two evenings this year, quite apart from the Johannesburg launch). It’s hard to think that a great lady at a comparably prestigious estate in, say, Bordeaux or Napa, would be involved in this way; and she’s there on the night in her apron, too, serving her guests. 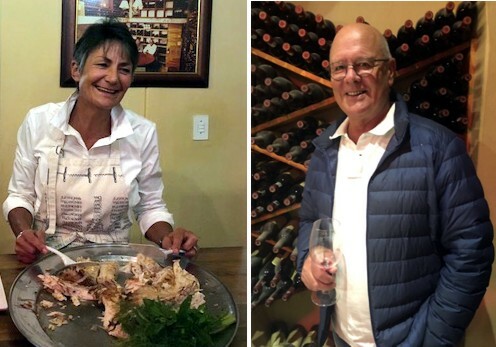 And hard to think that such an occasion – primarily for Kanonkop’s good customers, with a few media people and suchlike parasites thrown in – could elsewhere have this easy, warmhearted air of friends and guests coming to jointly celebrate things over wine and food. This has no air of being a smart, catered PR event, because that’s not how it’s conceived or what it is. Forgive me for being sentimental, but Kanonkop’s traditional annual snoekbraai always has such an effect on me, reminding me how unique this place is. Surely this is the most successful of the Cape’s family wine estates: with an unequalled reputation for quality (almost continuously among the top five in 18 years of polling to ascertain South Africa’s top wineries; this year in second place), and undoubtedly immensely successful as a business – it would be a success with just the estate range, headed in one sense by the famous Paul Sauer, in another sense by the ultra-expensive Black Label Pinotage; but there are also around 1.8 million bottles annually of the Kadette range made from bought-in mostly Stellenbosch fruit, getting very good prices too (and that number is rising steeply in 2018). Winemaker Abrie Beeslaar has brilliantly raised the level of this range, while doing quite the opposite of neglecting the estate wines. And yet, triumphant Kanonkop manages to retain the air of being a working farm, despite the ever-increasing expanse of the winery buildings. The warmth and friendliness of the owners, and their lack of pretentiousness and show, dictate the atmosphere. I can’t believe that there is any comparable wine property in the country which commands as much affection as respect. To the tastings. We first had one of the current releases, 2014 Cabernet Sauvignon (R395) – a little cedary oak still in evidence, bright and dry, with typical dusty, tealeaf fruit and a herby edge; lean rather than well-fleshed, and still very youthful; not the best vintage yet of this long-lived cab, but serious and good. Then the new Black Label Pinotage 2017 (R1850), which might well prove one of the best vintages yet – certainly more magisterial than the previous. It’s already been warmly welcomed by Christian, and I’m happy to endorse that. It’s still very young (Kanonkop intends to in future hold back the release of this wine for another year, which is an overdue move), though I can’t deny that it’s approachable now. The all-new oak still shows a little – adding to the wine’s unmistakeably luxurious air, and some drinkers will enjoy that. Plush it is, but there’s a lightness to the richness; supple, ripely firm tannins; the balance is superb and in a good few years greater complexity and harmony will come. No need even to think of it as a pinotage (not that the variety needs apologising for) – there’s nothing particularly varietal about it: it’s just an excellent red wine. More than enough praise has been justifiably lavished on the Paul Sauer 2015, so I’ll just mention another current release that mightily impressed me on the evening (when there were, as always older vintages available for tasting – going back to Paul Sauer 1998, which was good enough to make me very pleased that I still have some bottles). The Kadette Cape Blend 2017 (46% pinotage with 30% cab, 18% merlot, 6% cab franc) is excellent value at R105 ex-cellar; in fact it’s not easy to think of a better value wine at that sort of price in the country, especially with this volume. Almost certainly this is the best Kadette Cape Blend yet; interestingly, it’s the first Kanonkop wine to be made with the automatic punch-down system that they’ve developed to fit, gleaming and impressive, over their existing open concrete fermenters. Happily, there are 1.2 million bottles of the stuff (take the price and do the arithmetic if you want to confirm that Kanonkop‘s doing just fine). I asked Abrie if it was made in batches, given that volume. No, he said, “We have 200 000 litre tanks that we use for that, and we make one big blend. It is important to us that all our wines are the same that go into the market.” The wine is drinking just fine already, but I’m going to leave my bottles a few years more. Oh – and Marie’s supper was delicious, as ever. Wonderful people, wine and farm! Keep the good work going! Heartily concur on the Kadette. I had the first half of a bottle last night and was very impressed. No need Tim James to ask for forgiveness for “being sentimental”…. we need more of that in our world today. On 9 October 2004 “Harold and Anthea Eedes gathered round the snoek braai at Kanonkop to celebrate FRIENDSHIP”. Harold loved his friend “Krigie” (as he called him). It was a wonderful occasion with our friends. Precious memories.